Across the world’s vast mountain ranges, snowfields act as natural reservoirs that store water during the cold months and, in the spring and summer, release water to rivers, streams, and groundwater. In the western United States, about 75 percent of water resources originate from snowmelt, making it indispensable to the region’s ecosystem, agriculture, industry, and people. While western skiers enjoy snowpacks that commonly exceed 5-10 meters, shifting earth system patterns are raising concern by those tasked with planning and protecting public infrastructure. Warm, heavy rain on snowpack can result in water runoff that exceeds the design limits of existing infrastructure, such as roads, bridges, and culverts. When the water rises, the impacts can be severe from social and economic standpoints. In December 2007, for example, a series of strong tropical storms streamed into western Washington state. The first left snow in the lowlands and mountains. Subsequent storms brought warmer temperatures, high winds, and record rainfall. Landslides and flooding occurred across the region, resulting in scores of rescues and loss of life. 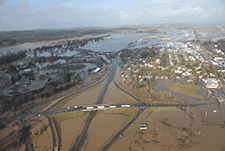 And for days, a portion of Interstate 5—the major connection between Seattle and Portland, Oregon—was submerged by 10 feet of muddy water. In total, the storms wreaked more than a half-billion dollars in damage for the region. The Federal Highway Administration estimates that, like portions of Interstate 5, more than 70 percent of roads in the United States are located in regions that could also be impacted by extreme snowmelt events. Most existing, high-risk public hydraulic infrastructure is designed to withstand once-a-century, 24-hour storms—events estimated by scientists in precipitation intensity-duration-frequency (IDF) curves. In regions with significant snowfall, however, standard precipitation-based IDF curves fail to capture the impact of snowmelt and rain-on-snow (ROS) events. 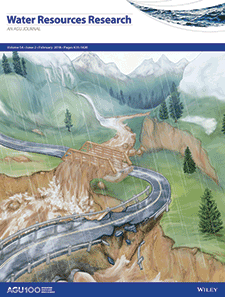 To better inform the design decisions for public infrastructure, a team of PNNL scientists and engineers—with support of the Strategic Environmental Research and Development Program (a partnership of the U.S Department of Defense, Department of Energy, and Environmental Protection Agency)—took on the question of better calculating the contribution of snowmelt and ROS to extreme runoff events. The PNNL team used observed daily precipitation and changes in snow-water at 376 Snowpack Telemetry (SNOTEL) stations across the mountains of the western U.S. as the basis for next-generation IDF (NG-IDF) curves. The goal was to create more reliable estimates for extreme events that can be globally applied to infrastructure design, engineering, and planning. In a paper published in the journal Water Resources Research in February 2018, the PNNL team reported that standard precipitation-based IDF curves were subject to under-design at 45 percent of the stations in the Pacific Northwest, the Sierra Nevada Mountains, and the Middle and Southern Rockies. Underestimation of 100-year, 24-hour events was as high as 125 percent. The team also proposed NG-IDF curves by incorporating the impact of melting snow. Although IDF curves have been used for much of the past century to calculate the impact of precipitation events, Hongxiang Yan, a PNNL postdoctoral research associate and the lead author of the paper, says the PNNL study is one of the first to include snowmelt and ROS into IDF curves that can be consistently applied to hydrologic models. “With growing urbanization, it is more important than ever to inform public decision makers and give engineers next-generation tools to help them design infrastructure that will protect people, as well as our homes and public infrastructure,” Yan said. Reference: Yan, H., Sun, N., Wigmosta, M., Skaggs, R., Hou, Z., & Leung, R. (2018). “Next-generation intensity-duration-frequency curves for hydrologic design in snow-dominated environments.” Water Resources Research, 54(2), 1093–1108.